I had a minor meltdown last night. Okay, those of you who helped me through it know that there was nothing minor about it, but at least it didn't last very long. That's something, right? What is it with me and the water works these days anyway?!? 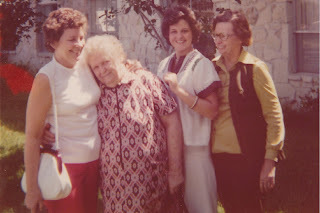 If you have followed my blog, you know that my family is blended - at best. The Dad I just lost, the one pictured below, was actually my stepdad. He was the best Dad in the world and the only one I ever knew. He was actually the best person I've ever known. There was never a person that met him or knew him that didn't like him. There aren't many like him on earth. Honestly. Why am I sharing all of this you ask? Well, because somehow, in someway, it's part of my move toward a mobile life. It is connected with who I am and where I'm headed. Don't ask me how, but that's the why. My birth father died when I was nine months old. Last night I found out that the aunts and cousins on my birth dad's side of the family are actually half-sisters that never even knew him! Couldn't someone have told me before now?!? All these years I thought that they were the closest "blood" I had. Now? Not so much. I know it doesn't really matter. Love is love and they're the same great folk they've always been. Nothing will change that, or our relationship, but it was a little bit like finding out you're adopted. It was a shock and it took me awhile to digest it. I lost a huge chunk of something I never even really had, and found myself grieving over yet another loss. Yet another bizarre awareness. There must be something in the air. I've cried more these last 3 months than I have in my whole life. 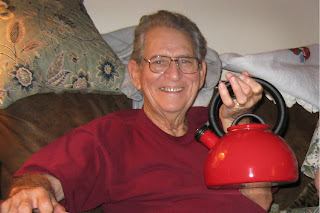 On a very positive note, I mentioned at the end of a previous blog, that I wanted Dad's red tea kettle to go with me on the road one day in my RV. I can't wait for that day! Well, I got the courage to ask Mother for it and she gave it to me this week. Woohoo! Here's a picture of Dad when I gave it to him for Christmas in '07. That's all he wanted that year and was so happy to get it. Sweet man. This will be my last entry about family for awhile (you're welcome). I'm movin' on, so to speak. 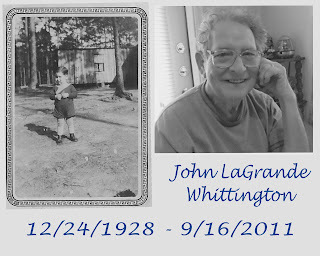 With that in mind I just have to post this picture that I put on FB on Christmas Eve because 12/24 was Dad's birthday. This Holiday was tough; next year will be better. Thank you for all the love and support. So glad you're feeling better! And so cool you got the tea kettle! Something really special and a perfect gift from your dad. Stop that crying!! IMMEDIATELY!! The year is drawing to a close, the new year awaits!! Resolve in this new year--NO MORE CRYING!! Darlin' Debra - blood doesn't define you, well maybe medically it does, or at least it has some input into you. It may make you feel like you belong, but that is just a mirage, and can be broken at any moment. It's more about the relationships we have with people, however temporary, that define us more so then blood. Be happy that you have a family, if in name only, that cares about you and loves you, for you, not just because you are "blood". Isn't that a better relationship anyways, one that is freely given, over one that is dictated by birth? Just look at it from a point of power instead of as a victim. The shift in perspective will set you free. @ Tammy - I agree. 100%! I am blessed with a wonderful family and am very happy. In fact, I will spend this evening with my brother/nephew at his house, sitting with him and his wife around an in-ground campfire on their patio. Heavenly. Tomorrow I join Shirley and Sheree for our annual Sisters' Day Out Christmas Outing. We have a great relationship. Full, half, step - it does not matter. (1) Unless you are the last one in your bloodline and the only one left on the face of the Earth, I don't know how to help you understand what that feels like. (2) We do not differentiate in my family between full, half, step, or whatever. I did that only for the sake of the article, for clarification. Recently my niece/sister and great niece and her grandmother went shopping for her bridal gown. Such an exciting, glorious day. IF I were a full sister or a mother to one of them, I probably would have been included in the day, but I'm not and wasn't. It was their immediate family, nucleus time. As it should be! There is no problem whatsoever. They love me. I love them. And I didn't think anything about not being there. I'm just saying - they have bonds I don't have. It very rarely even comes to my consciousness. I think this Holiday Season was a major exception to that rule. For a lot of reasons. 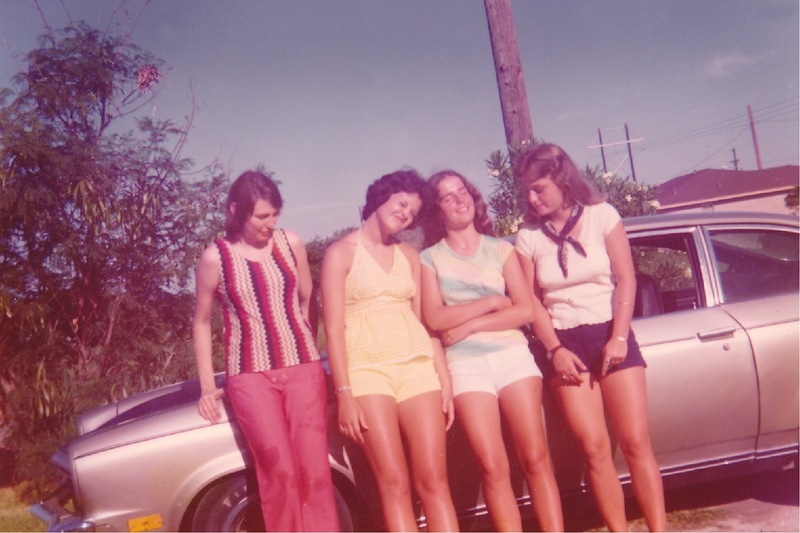 I am very blessed to have many significant bonds and very close relations, family-wise and otherwise. I need nothing more, but it doesn't matter how close those bonds are, I will never know what it is like to see my beautiful daughter stand in front of a 3-way mirror looking like an angel in her bridal gown. That's just a simple fact of life. It doesn't mean I don't celebrate that moment with my family. It's just... different. As it should be. 12/27/11 - Clarification on Family "Ties"
12/11/11 - MI 2 of 3 COMPLETE!